Something is happening in the woods of Gaspereau. Follow a bumpy dirt lane and you’ll find a straw-bale barn tucked in the trees where a series of albums with startlingly high production values have begun emerging. The Muddle’s new release, Still Waiting on a Fix, is the latest. Hennessy went into the studio with a couple of songs, no agenda, and an open mind. Adam, whom I know from my own experience at his studio, is a volcano of ideas and ability. He dove into his role and produced the heck out of ten tracks, and The Muddle was born. 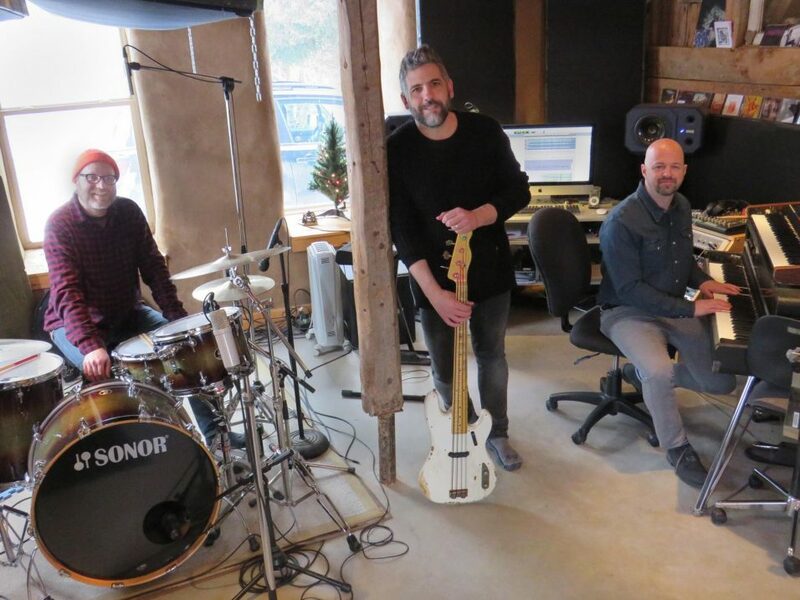 During the two-year process, Jeff wrote more songs, Mark altered and added to them, Nic D’Amato laid down his sick bass riffs, and they became a band, along with a few added guests. Jeff Hennessy is passionate about the pop music of his youth, and has paid tribute to it with this album. It references ’80s pop and rock, updated with contemporary synth and electronic sounds, plus – yes! – some banjo. And sleigh bells. The tracks are hooky and fun, angsty and meaningful. It harkens to that golden age of albums, with a narrative arc and recurring motifs. It sounds crisp and inventive and good. The Muddle’s album release on January 24 at The Church Brewing Company was an old-school listening party. They played the recorded tracks and Mark and Jeff talked about the process of putting them together. It gave the audience a chance to hear the album in a great environment and appreciate fully the work that went into this project. These strong songs will, however, soon demand some live air-time. Musicians gotta make, and these profs know how to play. Watch for show dates to be announced this spring.